Viktor Weber is a pioneering expert and thought leader in technology induced real estate innovation. He is the founder and director of the Future Real Estate Institute, which researches about the impact of technologies such as artificial intelligence, blockchain, robotics and 3-D printing on the built environment and its business processes. He consults corporations regarding innovation strategies, implementation and innovation- & change management. Adding to this, Viktor Weber frequently publishes in international professional publications and is a conference speaker. Currently, among other things, Viktor Weber works on the usage of machine learning for commercial valuation. He is also co-founder of Lean Consultancy, which is specialized in Digital Transformation and Software Development. As Global Shaper of the World Economic Forum Global Shapers Munich he fights for education and integration. The underlying goal of this article is to highlight issues in current smart city approaches, find common success factors of established projects and to create a framework based on these findings, which should lay ground for future smart city concepts and research. In order to improve future smart city projects, it was deemed reasonable to conceptualise a framework with transparent steps that can counter some of the addressed problems and could potentially lead to more citizen engagement as well as a higher acceptance rate. Based on findings from academic as well as practical literature, the Future Real Estate Institute has conceptualized a preliminary framework for the planning as well as implementation of a smart city concept for already existing cities, which shall pose as a basis for discussion and future research. The ideation phase is initiating a smart city project and is the only part of the Synergetic Smart City Framework that is not fully transparent, since the communication — feedback — loop is restricted to impulse — provider and governmental entity. 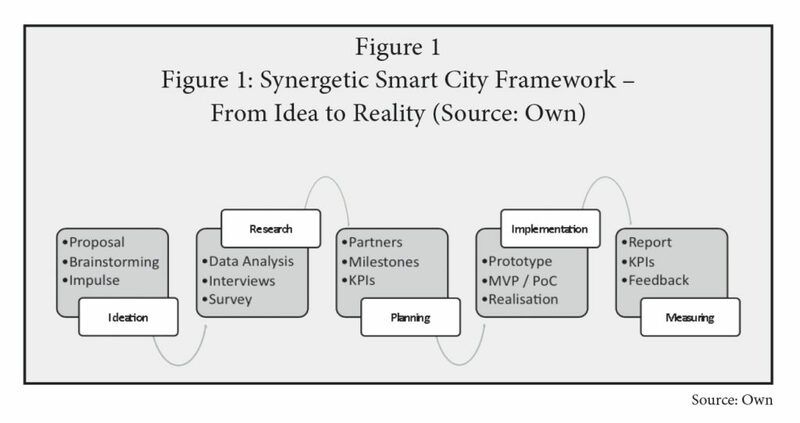 The first step of the Synergetic Smart City Framework is the impulse, which has to come either from a governmental entity or an external impulse-provider, such as academia, a startup, a corporation, the civic society or an individual. Similar to a design thinking process, it is advised that the impulse-provider brainstorms together with governmental decision makers about the potential outlines, goals, resources and already existing projects, which would impact the smart city project.27, 28 Already existing ideas from the impulse-provider should be presented and analyzed according to feasibility and practicability. In this step, current problems and future challenges have to be assessed provisorily, in order to formulate an adequate proposal. Depending on the legislation, a smart city project has to be tendered or funding has to be secured, which makes an initial proposal necessary.29 The city’s government has to make this step on its own and lay ground for a smart city project by asking for funding or directly issuing a call for proposals. It should be communicated that any partner has to act according to the Synergetic Smart City Framework, which could ensure transparency and citizen engagement. In order to increase granularity, a mixed-method approach is recommended, which can help understand already identified issues, reveal upcoming challenges, stakeholder sentiment and foster ideas for a holistic concept.30 Preliminary research objectives should be defined, which would translate into the research’s scale. Among the research objectives should be to understand what the current ‘pains’ of the inhabitants are, how they perceive their city, what they understand of a smart city and what they wish for their city’s future. The interviews should be conducted with samples of all city stakeholders, which we divide into permanent inhabitants, temporarily inhabitants (commuters, tourists, refugees), employees of the city administration and public utilities, academia, corporations, startup entrepreneurs, politicians and non-governmental organizations. Yet, the sample size and level of saturation is dependent on the scale of the project. Based on the findings from data analysis, as well as interviews, a survey should be designed. Depending on the project’s scale and previous findings, it could be adequate to use Likert scales as well as open-ended questions.37 The survey should be conducted online as well as offline with a similarly distributed sample as in Step 5, yet with a larger sample size. KPIs have to be set according to the varying objectives, yet could also be adopted from standards such as ISO 37120:2014 or based on the Gross Social Feel-Good index as proposed by Hara et al (2016).41, 42 Adding to result oriented KPIs, as with the previously mentioned metrics, it is important to measure the interest, engagement, sentiment and acceptance during the entire ideation, planning and implementation process, which requires a different, individual set of KPIs. Each objective has to be broken down into feasible milestones, which can be measured and calculated. The sentiment measurements during the planning process indicate how to break down the long-term objective. Thereby, the project would not overwhelm the city’s stakeholders, but allow time for adaptation, trials and constructive feedback. Concomitant, it is vital to build strong partnerships between the city’s stakeholders and to find suitable external partners that are capable of realizing the project’s milestones.43 Depending on the legislation, calls for offers and a bid process could be required, similar to Step 3. Since one critical issue of smart city projects is cost, it is recommended to include a prototyping stage into the implementation phase.45 A prototype could be digital mock-up, a presentation, demo-video or a virtual reality experience, which would foster feedback, test for feasibility and create a first proof of concept. In case of the smart city project website, the MVP could be the open planning tool, which could be added to the regular website with basic functionalities and advertised in the local media in order to measure interest and engagement. The realization of milestones is always dependent on generated data and feedback, which might make it necessary to go back to previous phases/steps of the Synergetic Smart City Framework. Due to the fact, that the communication — feedback — loop is part of every step, measurement in Phase 5 rather describes the final results after a long period of iteration and multiple learning cycles. These ISO standards help to quantify, in a standardized manner, parameters addressing the economy, education, telecommunication and governance as well as other major components influencing the quality of life and sustainability in a city. Step 13 can be seen as a more diligent, in-depth analysis, compared to the constant measurements as described in Step 7. Even though the Synergetic Smart City Framework uses feedback at every step, a concluding feedback phase should be included in order to aggregate and analyze the entire project laying ground for future projects and knowledge-creation. Crucial for the process is to summarize the data, findings, feedback and results, which should be communicated in an understandable report. The city’s stakeholder should be able to comprehend what the project has done for them by elaborating the cost vs. profit structure as well as non-monetary benefits. Each report should be written as a case study in order to enhance learning for future smart city projects. By including a large scale research phase with input from all stakeholders, the framework helps to avoid a mere focus on technology, since the ideas, wishes and thoughts of all stakeholders are heard, which will help to increase the acceptance of the project. Issues such as low citizen involvement and low acceptance could be avoided by extensive feedback from city stakeholders at every step of the Synergetic Smart City Framework. The reporting phase, combined with the aggregated data from each feedback step, lays ground for data mining, which can help to create inferences for future models and smart city concepts. One limitation of the model is that the issue regarding adequate investment has to be treated as an external factor, which is still decided in a top-down approach, depending on the city’s government, except a smart city project is crowdfunded, which might be an option in the future. By pursuing the Synergetic Smart City Framework, with its intrinsic openness, transparency, engagement and data anonymity, it is aimed for an enhanced innovation adaptation, increased learning, fewer resentments and the creation of synergies between all stakeholders. This approach has to be tested in an implementation process, which would be a goal for future research. 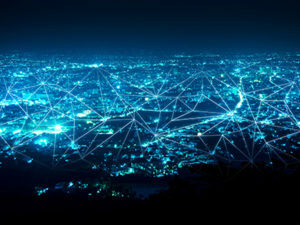 Furthermore, it is deemed necessary to collect more standardized data about currently existing smart city projects, including their citizen feedback, which could be used to find more issues as well as success factors. Adding to this, it might be possible to create weights for each success-predictor, quantifying a smart city framework in future research.